Simone Weil and Howard Thurman . 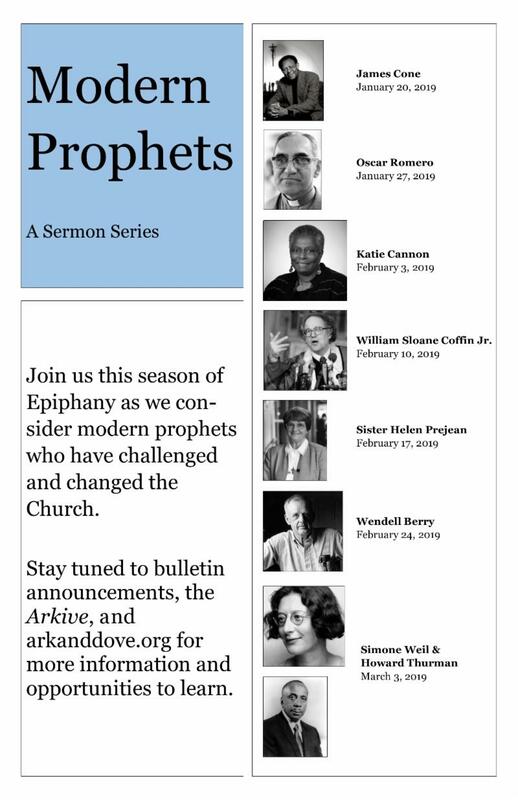 For the past six weeks we have focused on Modern Prophets in our worship services. These modern prophets, like the Biblical prophets before them, call us to acts of Mission, Mercy and Justice in the world. Prophets are not always fun: part of their work is to make us shift in our seats, to cause discomfort, to confront us with their understanding of God's dream for the world. What's the difference between a true prophet and a loud-mouthed nag? Prayer. What's the difference between a disciple and a caustic Christian? Prayer. What is the difference between Christian advocacy and partisan shouting? Prayer. We can not effectively work for the right kind of change unless our discipleship is grounded in prayer. Yet, for many of us, prayer-time is scant or unproductive, and not as satisfying as we would hope. As we transition from the season of Epiphany, and a focus on the light of modern prophets, to the season of Lent (the season of getting our hearts ready for Easter), we will turn our attention to prayer, for, undoubtedly, Christian action that is not rooted in prayer will be incomplete, scategorical and maybe even way off course. We are inviting, encouraging and even pestering (and arm bending) you to read a book about prayer this Lenten Season. 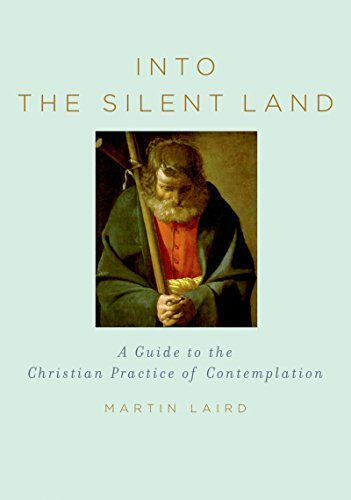 Into the Silent Land, A Guide to the Christian Practice of Contemplation by Martin Laird will be the focus of much of our preaching and our Lenten adult small groups. We are offering five groups on Sunday, Monday, Wednesday, Thursday and Friday. It is time to check the bulletin board in the lobby to see what suits your schedule, or give Pastor Jon or Pastor Tim a call at church. The groups will be meeting three, four or five times depending on the day and leaders. Now I know you have been saying to yourself, I could do better at prayer, heck what's five meetings (or less)? The book is short and practical; it's not a boring tome. Laird shares thoughts like this: The more we realize we are one with God the more we become ourselves, just as we are, just as we are created to be. Even if you can't, or refuse to join a short term small group, I hope you will read along and try some of the practices that Laird lays out in his book. I realize minds tend to go straight to money when the word ‘stewardship’ comes up. This is a bit like thinking only of height when considering aptitude for basketball. Stewardship, at its core, is about what God equipped us with and what we choose to do with it. In other words, stewardship is about talent and our actions with it. Let’s talk about talent. It’s one of the most intimidating things I can think of and often makes people deeply uncomfortable. Why? We’re unaware it exists, we doubt its value, and sometimes we desire what others have while ignoring our own gifts. Talent is a confounding thing. Society demands that we downplay or deny what we have in the name of modesty and humility. Discussion of our talents requires us to walk the fine line between truth and bragging: a trick so difficult we sometimes decide it just isn’t worth it. We shirk opportunities to engage. We deny our passions. We turn bright pink when someone generously compliments us (or that might just be me). Talent is awkward! This week, the prelude is an arrangement of Philip Bliss' hymn It Is Well and the flowing arrangement is a soothing reflection of the words to the tune. The introit, Open Hearts, Open Minds was composed by Barbara Campbell for 2006 UMC General Conference. The adult choir presents Mark Hayes arrangement of Gather Us In, a spirited version of Marty Haugen's inclusive worship song. There is still a call for volunteers to assist with running the audio board during the band led service. I would like a core group to work on a rotating schedule, and will train anyone who is interested. No experience needed. This Sunday we are introducing a new doxology for our rotation. Please give a listen to 'Doxology' by Stars Go Dim to get this excellent rendition in your ear. See you all Sunday! Some facts about Simone Weil: She was French. She was educated as a philosopher and worked on an automobile assembly line. Her life was caught up in the whirlwinds of radical social action, the Spanish Civil War, and World War II. In 1938 she had a mystical encounter with Christ. She was working for the Free French in London when she died at age 34. She belonged to no political party and no church. Nothing she wrote was published until after her death. She was very awkward, and very odd. And yet there are many who believe that what she has to say about God, community, suffering, love, beauty, sacrifice and prayer is unique and indispensable. All who would like to learn more about this most improbable “modern saint” are welcome to gather with Parish Associate Stephen Price-Gibson (spricegibson@hotmail.com) for lunch and conversation about Simone Weil, this Sunday at noon on March 3, in the Ark and Dove room. Does life have you feeling distracted, de-centered, and disillusioned? Do you struggle with prayer, with what to do and say? Do you long for a deeper walk with God? We invite you this Lenten season to join small groups in reading Martin Laird's Into the Silent Land: The Practice of Contemplation . This short and widely-regarded book will help you find your center, stimulate your prayer life, and further your discipleship. Books are on sale in the lobby as well as a sign-up for small groups, which will begin March 10 . Books are $18 and can be found online . Please contact Pastor Jon with any questions (jgnelson1985@gmail.com). Please join our family-friendly Shrove Tuesday pancake dinner this week on March 5th at 6:30 pm ! Enjoy pancakes and bacon on the house! Just bring a pancake topping (except syrup), side dish, or drink to share. Perhaps enter our pancake flipping contest this year for a chance at a prize? We hope to enjoy your company! Nicole Howe, nicolehowe123@gmail.com. All youth, young adults, and their associated grownups are invited to an information meeting on Sunday, March 17th (new date!) at 5pm in the Sanctuary to hear about our opportunities for this year's Summer Trips (Habitat, The Center, Youth Summit, etc...). We will serve dinner and share info and stories about these exciting happenings. More info is being mailed to each home, so please keep an eye out for the flier, and mark your calendars to join us that evening. If you have any questions, please reach out to Pastor Jon (jgnelson1985@gmail.com). Around the world, millions of people lack access to sustainable water, sanitation, education, and opportunity. 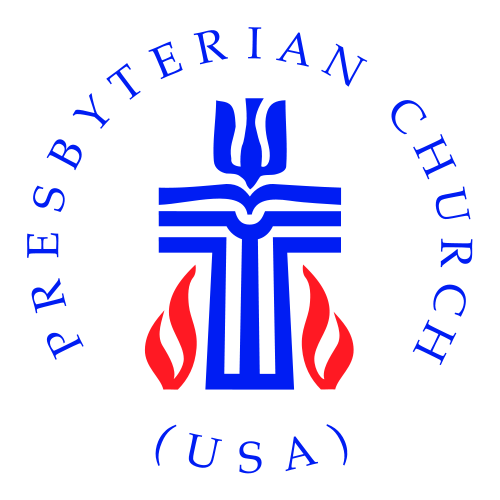 The three programs supported by One Great Hour of Sharing are Presbyterian Disaster Assistance, Presbyterian Hunger Program, And Self Development of People. These programs all work in different ways to serve individuals and communities in need. From initial disaster response to ongoing community development, their work fits together to provide people with safety, sustenance, and hope. Received during the season of Lent, each gift to One Great Hour of Sharing helps to improve the lives of people in these challenging situations. The Offering provides us a way to share God’s love with our neighbors in need. You can find offering envelopes in the chair pockets or you can give online. Thank you for your help in supporting these important programs. Cheryl Schafer, Mission Elder, csscas@verizon.net. CAP FEATURED FOOD ITEM Featured item for March-- RICE (wild rice, short grain brown rice, basmati, etc.). Please drop off food items in the Mission Zone bin. Thank you for your donations! 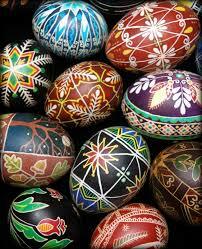 Make a traditional pysanky (Ukrainian Easter Egg)! All materials and instructions provided. Hosted by Greg, Diane and Ellen Makar. Donation of $5 per person appreciated. You will take home your beautiful egg, plus the waxing tool and wax to decorate more eggs at home. The Makars have practiced this tradition for generations. No childcare provided. If your child is able to do detailed drawing and hold a raw egg for over 2 hours, they are welcome. Space is limited, so please sign up early (so we know how many supplies to get). Ellen Makar, eemakar@aol.com. PRAYERS OF HEALING AND SUPPORT for Amy Benson’s friend, Brian Shriner, who is in need of a kidney donation; Bruce and Karen Sanders’ granddaughter, Hannah Algoet; Jay Olson; Linda Jordan; Corinne Baker; Lori Kronser; Tameka Oberman’s grandmother; Nikol Sahai's mother in Slovakia, Marie Krizanova; Kim Schroen; Jonah Murray; Chris Wilkens; Pat Sise’s brother, Justin; Amy Tardiff’s father-in-law, Richard Tardiff; Margaret McGillivary’s friend, Kim Nolet; Declan Steward’s father, Daryl; James Franklin’s father, Homer; Kameron and Kamarii Miller; Karen Dodson; Cheryl Walcutt’s sister, Judy Walsh; Amanda Wehage’s family; Jon Nelson’s aunt, Linda, and grandmother, Peggy; Chip Burnett; Lydia Doughty; Laura Doughty's aunt, Marie; Ylonda Fauntleroy's aunt, Bernice Taylor; Diane Johnson's aunt; Brooks Emrick and her sister, Susan; Vaughn Brown and his sister, Kathie; Ann Hirschy; Frances Keyes; Dot Forloines; Helene Marchand-Stancil; Laura Willoughby's father, Norman; Julia Kirby's mother, Margaret Floyd; Amy Carskadon's nephew; Erika Sealing's son, Trip, and grandmother, Margaret Schade; Sue Hanburger's grandson, Enzo; Edie and Richard Budd; Dotty Kaufmann's grandson, Nathan; Amy Benson's family; Lisa Mezaache’s friend, Pearl McNamara; Dorene Chen’s grandfather, Tian Tao Li; David Michels; Laurie Barrow’s uncle, George Slater; Jerri Webb’s friend, Mary Van Orten; Evelyn Ziegler; Thomas and Judy Kochis; Cynthia Knott’s mother, Madeline; Sage Worrell; Wayne Sweet; Yadong Wei; Mark Constable; Laura Talbert’s friend, Kristin Goin; and Doug Mattingly’s mother. PRAYERS OF SUPPORT go out to the guests and churches involved with Winter Relief: Community UMC, Severn Christian Church and Trinity UMC. THE LOVE AND PRAYERS OF THE CONGREGATION go out to the Paronto and Haight families upon the death of Alta’s father, Robert Haight. THE LOVE AND PRAYERS OF THE CONGREGATION go out to the Sensenig family upon the death of Daryl’s mother, Cathryn. THE LOVE AND PRAYERS OF THE CONGREGATION go out to the Slater family upon the death of George Slater. PRAYERS OF PRAISE AND THANKSGIVING on the engagement of Kennon Bauman and Tameka Oberman.